With his recordings of the ‘48’ (10/88 and 9/91), Goldberg Variations (3/90) and French Suites (4/94), Keith Jarrett long ago established that he does not come to Bach with any kind of agenda other than to represent the music as unpretentiously and respectfully as he can. 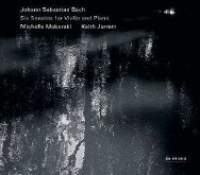 His is not jazzman’s Bach; indeed, he has said that Bach (which he learnt to play before he took up jazz) is for him a release, an opportunity to worry less about projecting his own personality than that of the composer. The evidence of this recording of Bach’s six wondrous sonatas for keyboard and violin, in which he is joined by Michelle Makarski, the American violinist with whom he has worked before on pieces of his own, is that nothing has changed in his attitude. There is nothing gimmicky here: from Jarrett come soft hands producing clear textures, well-judged tempi and precise but never fussy articulation; from Makarski, stylish and musical playing, Baroque in its low vibrato and relaxed tone but with still a touch of ‘modern’ sweetness to the sound. The air of two fine and technically wellequipped musicians happy to give themselves up to music which is more than capable of speaking for itself is near-total: slow movements are quietly dignified (the only indulgence, perhaps, being a dreamily drawnout legato opening Largo of No 5), while fast ones are allowed to build impressive heads of steam out of their own resources with perfect naturalness. Even the booklet keeps its own counsel, with no programme-notes, no artists’ mission statements – just track listings and photos of the sessions. Of course, this will not be what every listener wants. If you like the bend and whip of a Baroque violin you won’t find it here. Some might feel that at the very least the opening of No 1 is a touch laboured and that there could be more of a lilt to the first movement of No 2. For more individualism and interpretative input you should probably look elsewhere, perhaps among other violin-and-piano versions to the little-known treasure that is Ruth Waterman and Morey Ritt’s deeply felt (though less well recorded) recording for Meridian. But for its cool beauty and unaffected honesty, this recording is one that will be very easy to live with.